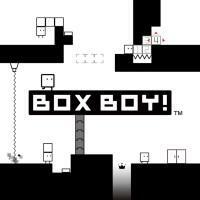 A puzzle platformer with a charming minimalist aesthetic. You play as a box with the ability to extrude, retract, and detach a few more boxes of the same size which can be used in a variety of ways - making platforms or bridges, shielding against hazards, or snaking through gaps or onto high ledges. Your goal is to use these boxes to proceed through a series of puzzle levels. Jumps are a little floaty but that rarely matters. There’s a Portal -reminiscent strategy of instructional scaffolding: mechanics and their implications are introduced via simple guided puzzles and then the player is presented with a series of scenarios to navigate, each slightly more challenging than the last but never becoming unmanageable and always bookended by checkpoints. Each level also has some collectibles that aren’t required to beat the level but are required for a “perfect clear” and which are only available until you’ve used a certain number of boxes on this level attempt. Presumably this was to position them as something you come back for once you’ve mastered the mechanics enough to get through the level without unecessary box use, but in practice it punishes learning the mechanics through experimentation. There’s several hours of content here including a bunch of challenge levels, though that does lead to the odd situation of the game “ending” with plenty of levels remaining. It’s hard to complain about extra content when even the core game feels like it would have been enough, but the bonus nature of the other content feels a bit like an excuse for it to be somewhat less polished of an experience - the difficulty ramps up and the instructional scaffolding is largely missing. That doesn’t make for bad design, but it’s different design, which feels like an odd choice as people are likely to prefer either the base game or the challenge levels but must play the first to get the second. I Stopped Playing When: I finished the story levels. I tried some of the challenge levels, but I found these more inscrutable and less suited to relaxed play.